Rated 4 out of 5 by Vielspielerin from Not bad, there is room for improvement I liked the storyline, though I miss the little spidery evil puppet and have to say it was not very complex. That is why I only give 4. With not very complex I am NOT talking about the puzzles, I always play in casual mode, so I will not remark on those. The story was very straightforward, that is what I mean with not complex. There were no real obstacles in it, no dertours (or at least not serious ones). Given that I could not go on with the bonus chapter (tried three times) I am only recommending the normal edition. Rated 4 out of 5 by dancemom1 from Excellent addition to this series... Hi all! Well, we have #9 in this series. As always, I review mostly on the game play and not the story like, as others do a much better job on that than I can. This game follows along the same as all of the others, except that I feel that the graphics are far better and extremely well done. Animation is exceptional, with really nice facial movements. Colors are bright and clear and this game does not have the "fuzzy" overlay that most of the other in this series had. Game play was excellent. The story line is the usual, but for some reason, feels a little different. Maybe because the animation makes it feel a lot more realistic. Voice overs are very well done, age and character appropriate. We also have emotion and more realism, fear, urgency, etc. The "bad guys" are wearing masks, and their voices actually have that muffled sound you get when you wear a mask. Music is nice, but moves with whatever is happening at the time. Not a lot of sound FX, but enough for more realism. We have a helper in the way of a mechanical cat. When not in use, he is sleeping, so he is not bothersome. He is very useful and not just for high places either. HOPs are nicely done. I didn't run across a lot during the demo, but we did need to match items and we also had straight lists. The scenes are clear and items are not difficult to find. I didn't see that we could switch to something else, but I wasn't really looking either. I was engrossed in the game. Puzzles were interesting and a couple were a bit new and took me some time and thought to complete. Very well done. Hint system was helpful, but occasionally did say "nothing to do here at the moment." Don't you just hate that! We do have the transport feature in this game, which is helpful since you do a fair amount of back tracking. We don't have much in the way of collectibles, which is a disappointment. If I'm going to pay the CE price, I want more collectibles, other than figurines of the characters. Maybe I missed something. They are in various places within a scene and do not jump off the page at you. We also do not have them in every scene, so not many at all. I like this series, and have all of the others. This one is not all that challenging, but I liked the story line and the beautiful graphics, colors, etc. When I beta tested this one, I wasn't all that kicked out about it, giving it only a 3.5, but I see that the devs listened to our suggestions and made a number of changes. Personally, I think this is the best of the bunch. I think all levels of players will find this one entertaining. Yes, I am going to add it to my collection and I have upgraded it to a 4.5, simply because of the lack of collectibles. As always, try it for yourself and see what you think. We all have different tastes in games and you may not care for this one at all. Thanks for the reviews. Rated 4 out of 5 by mousemotorsrule from Twists and turns Get ready to save him! Faces are missing, eyes need repairing, money is exchanged! Graphics are wonderful with hardly any delays in play as sometimes new games suffer from. Smooth play, great visual extravaganza. I already purchased and cannot wait to continue the story and see what happens next. Rated 4 out of 5 by snapnhiss from "More puppets?" I thought to myself... 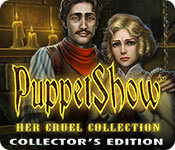 I wasn't thrilled to see another PuppetShow game but I gave it a try anyway. One thing I've always admired about this dev is their responsiveness to customer comments and complaints and this game shows a marked improvement from earlier games in this series. I like helpers unless they're animals wearing clothes or talk in a high, squeaky voice and this creepy robot cat is kind of cool. I love the graphics of course and the voice acting is much better than earlier games. Really nice HOS and the puzzles are easy (I have a low frustration level so I like easy puzzles.) This is definitely worth playing the demo, it's a very good game. Rated 4 out of 5 by Torpedo1 from The Eyes have It This was a fairly good game. I liked the Mechanical Cat and how to use it. Simple working HO's but nice and easy puzzles, Good Characters, Nice game flow, Good Jump Map, and I did find a character to collect. Did not really find anything else to collect nor any Morphing objects. Maybe I missed them. Devices were fairly inventive. Goes on my to buy list and a nice addition to PuppetShow. Rated 4 out of 5 by Chickadees3 from Fun game. My review is based on the demo played in custom mode. I had 23 minutes left on the clock at the end of the demo so that may indicate a shorter game. I found myself really admiring the artwork as I played. Crisp, clean lines, nice color and creative scenery all through the demo. Nothing too dark or small to see. The sound was good as well. At one point I had to lower the music because **spoiler alert** we're racing the clock to achieve a goal and the intensity of the music was causing me a lot of angst. Once I lowered it I was able to proceed without all the adrenaline flowing making me crazy :-) There wasn't as much challenge as I would have expected. There weren't as many HOG's or mini games and the mini's there were were fairly simple except for one type that I particularly dislike so I skipped that one. I didn't see any alternate game that could be played in place of an HOG. There were a lot of cut scenes, almost like watching a movie interspersed here and there with a mini game or HOG. Since I only played the demo and not the full game I don't know if it continues with lots of cut scenes for the entire game. Hopefully another reviewer will play the whole game and fill us in on that. Some other points to be noted are: we can play as male or female as we choose; there are some collectibles, not many and no morphing items. There are the usual achievements, wallpapers, screen savers and music and 4 modes to play in. There is probably a bonus chapter too but I forgot to look to see if one is there. Because of the limited number of collectible-type items and the fact that there are so many cut scenes and too few HOG's and mini games I would wait til the SE comes out and purchase then. There just isn't enough here to justify a CE price IMO. I sure was enjoying what play there is though so I definitely recommend you try the demo. Rated 3 out of 5 by kdblueey from SPOOKY, EERIE, WEIRD, AND FLAT OUT CREEPY!! BASED ON 30 MINUTES OF PLAYING THE DEMO (I COULDN'T PLAY ANY LONGER THAN THIS): I have to say that the WARNING that is given at the beginning of the game, even before you sign your name, (which incidentally is written in BLOOD), is right on point! From the two puppets that swing down letting you choose a MALE or FEMALE character, to the skeleton hands shuffling the cards, letting you also choose what your character will look like, gives you a little idea just how creepy this game is going to be. EVERY SINGLE THING ABOUT THIS GAME IS EXTREMELY SPOOKY, SCARY, AND FLAT OUT CREEPY! I won't go into the story line as other reviewers have covered that already. Here is my opinion on the brief (yet unsettling) time I spent on this game: 1. The cut scenes weren't as clear. 2. The music was appropriate for this type of game. 3. The colors fit the game nicely (dark, drab, and colorless). 4. A transporter map given at the beginning of the game (even the map was on the creepy side, showing two puppets hanging from a tree, while the bad guys point at them, while wearing their eerie-looking masks). 5. The HOS were difficult, IMHO. It was difficult to see what exactly I was suppose to be doing. I found myself using the HINT button, more than I like to use it. The scene where you have to find the parts of the robotic cat (which is your HELPER, BTW, and he isn't your 'typical' cat either) was difficult for me to figure out (at first), and I don't usually have problems with HOS in most games. This definitely isn't my type of game, but for those of you who like the creepy, the disemboweled eyeballs, or body parts, or headless dolls, THIS GAME IS JUST PERFECT FOR YOU!. Enjoy........................IF YOU DARE!! Rated 2 out of 5 by raindropdaisy from What the heck?! I have been in love with the whole PuppetShow series, until this one. What happened? There was no creep factor, puzzles were incredibly easy and just did not live up to the previous games. I sadly bought this before playing it as I relied on the quality of the previous games. A mistake I regret. I will still play any new games they bring out, however will be downloading the trial from now on. Rated 2 out of 5 by timothya from No Spiderboy? A rather dismal entry in a once-superior series. The storyline was rambling, chaotic, and absolutely awful. 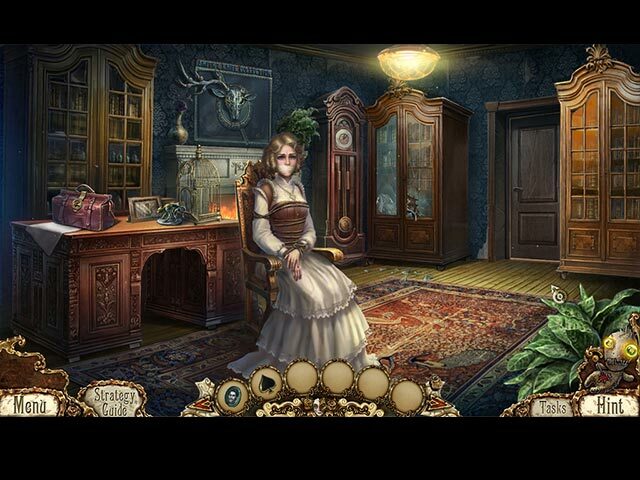 Pros: usual great graphics, enjoyable steampunk atmosphere. Cons: Same old music, same old everything except this one didn't have much of a plot. Come on, vengeful gypsy lady who was nice and evil by turns, magic powder, talismans, human souls moving around, what? In Puppetshow? The assistant was marginally clever but useless. Nothing really original here at all. Puzzles way too easy. Voice acting painfully melodramatic and a saccharine ending that was cringe-worthy. If the series is to continue, the writers are going to have to return to its successful roots - mechanical cleverness, no mysticism, no cutesy assistant, no morphing objects that have nothing to do with the game, concentrate on the basics or just mercifully end the series, please. Rated 2 out of 5 by santafeace93 from totally disappointed I am such a fan of Puppet Show but this time you were really scratching for hit.... NOT at all ....compared to the others, well this hit the bottom. Rated 2 out of 5 by pennmom36 from I Can't Understand Why This Game Would Appeal To Anyone LogieBaby hit the nail on the head, PuppetShow games lost their appeal a long time ago. Her Cruel Collection has nothing to offer, it has the same old storyline (how many cloaked figures have there been wearing the plague era masks in these games?) , it has the same mundane tasks (bet you knew there would be a ladder in the next scene, bet you knew before the cursor changed, to look in the front of the car AND the trunk or to look on the windowsill, right? ), and it has the exact same graphics as the Dark Tales series. I kept expecting Detective Dupin to show up and present me with the evidence he found! (btw, Dark Tales has lost it's appeal to most gamers as well!) You get to choose a gender and then choose between three different profile pictures within that gender. I wasn't impressed by this feature either it's nothing new, in fact I found this feature to make the game play less credible. I chose the female gender and was given the option to choose a blonde woman with braids, a teenager holding a fuzzy kitten or a young brunette who doesn't look like she ever held a job and would be devastated if she were to break a nail, humf, decisions, decisions, which should I choose. (it's not like the game will change according to my choice. I would rather have had the opportunity to choose my Mechanical Cat helper, maybe I wanted a cat with blue eyes and all chromed out! This Collector's Edition isn't very CE worthy either. There are 9 Collectible Puppets, you can't miss them, they aren't hidden, in fact, they are within Zoom Zones and the window doesn't close until you click to collect your prize. Other than Achievements, that's about all that you get. You can also check out the Collectibles and earned Achievements fairly easily because there are large pull down tabs available at the top of the screen. Once the kidnappers give you a deadline to raise their ransom request, a giant Clock is added to the screen as well. I hope there are no more demands because pretty soon my screen won't have any room left, especially if they demand a helicopter! 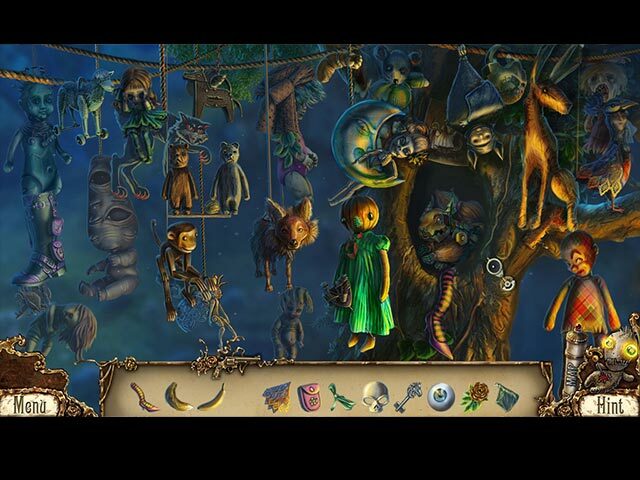 The Hidden Object Scenes should please just about everyone because each scene has a different type. There are the standard Interactive list finds, Silhouetted Shape finds, Keywords and even replacing items back into the scene where they logically fit. The Mini Games are decent, but nothing really challenging. Below are brief descriptions of some of the games you'll encounter during the demo: 1) Swap the pins to place them in the correct positions according to their symbols. 2) Fill the field with green chips in order to beat your opponent. Select green chips and the desired space, moving the chips one space duplicates it, moving chips more than one space will just move the chip. The chips turn adjacent chips to the same color. 3) Select two tiles to swap them and restore the stamp, some tiles are stationary. 4) Select the print button and choose matching pairs of money to gather them inside the bag or move them to the side, making sure torn and dirty banknotes don't get placed into the bag. This Collector's Edition has 9 Collectible Puppet Figures, 9 replayable Hidden Object Scenes, 17 replayable Mini Games, 4 Music Soundtracks, 15 Videos, 5 Screensavers, 10 Wallpapers, 8 Concept Art pictures, 12 Achievements, a built in Strategy Guide and a Bonus Chapter. Rated 2 out of 5 by LogieBaby from This Puppet Show installment is proof positive ( or should I say negative ) that the series should be ended When the Puppet Show series originated a few years ago, the games were inventive, appealing to the masses, and somewhat believable for a fantasy genre. Unfortunately the last 3 or 4 games have become so bizarre that I for one find these most recent efforts to be practically unplayable. The story line is nothing new. A rich father finds a suitor ( James ) to be totally unsuitable for the hand of his daughter ( Marjory ) even though this couple are deeply in love. James has been kidnapped by a couple of rogues in preposterous large beak masks and it is hinted by the pair that they are minions for a villainess. Why is it that these masks are so prevalent in games? One redeeming aspect of the game is the player selects the gender and has the choice of 3 avatars for the mission's rescuer. 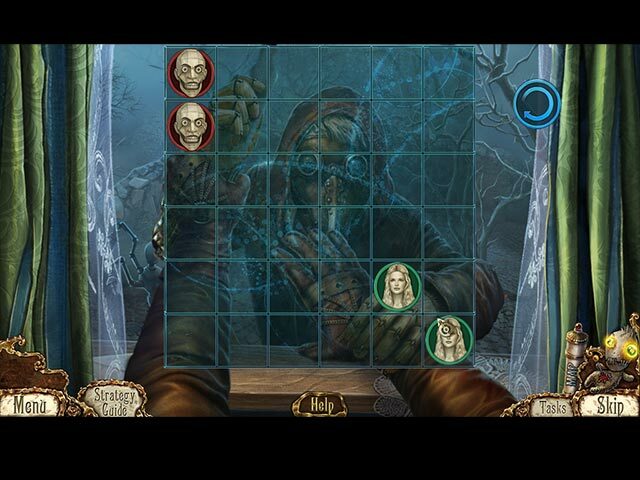 The puzzles and hidden object segments offer nothing new to HOPA enthusiasts. We get a mechanical kitty assistant ( UGH !!) and if there are any collectibles and /or morphs I didn't find any in the demo, nor did I care. There are too many series that have lost their way, primarily since they offer nothing new. This version of Puppet Show is evidence that ERS should either end the series or come up with something to rekindle the enthusiasm players once had for the series. Rated 1 out of 5 by codom from Good Story Ruined by Bad Game Mechanics The story in this game was actually pretty good. However, the extremely poor game mechanics drove me mad. Even when you have an idea of what you are supposed to do, you have to click in just the precise area to get it to work. I got so frustrated with it that I uninstalled it without completing it. As others have said, this game was slapped together with very little quality testing. Rated 1 out of 5 by charliehenry from Not so Fun Absolutely not my genre. Horrid. Rated 1 out of 5 by carterfamily3 from Not the best Game to weird. I don't like this game, it's to weird. I don't do reviews much on BF games cause I love most of the games. Ears has good games I feel but I agree its time to end this game, story line is same ,same. I like games with a better story line. Rated 1 out of 5 by Granny_Gruff from Another Great Series Has Died! I really did not want to be the one to write the obituary, but I have been forced into it! Marjorie is in love with James. James has been kidnapped, as have many other local citizens before him. When the others were returned, they had amnesia. Unfortunately for Marjorie, her father, the Mayor, refuses to help her search for James, so Marjorie calls in a detective and we arrive in time to see her kidnapped. We temporarily rescue her, only to lose her later. If you think things are in a mess so far, you have correctly grasped the story as it remains untold by the Devs in this new game in the Puppet Show series. Good stuff: There are puppets. There is minimal CE bling. There is a mechanical cat helper, not cute for a change and he'll help as long as you keep repairing him. Bad stuff: If you want Dark Tales artwork, a variety of junk HOPs, bland simple mini-games, and absolutely NO idea of what the plot is, then this is the game for you. All of the above and the missing logic and story-line as well as the incredible sameness of what you do to move through this game, and most of it done with the out-of-kilter bent the last few Puppet Show games have had will encompass the sadness that is this game. Play the Demo if you want to be depressed at the path another great series has gone down. I'll grab a box of tissues and play the first Puppet Show games while mourning their tragic evolution.